Bishop William Joseph Condon is a pivotal figure in the history of the Catholic Church of eastern Montana. As Bishop of the Diocese of Great Falls (which became the Diocese of Great Falls and Billings in 1980) in the mid-twentieth century, he presided over the growth of the church in Great Falls and Billings, due to the influx of federal defense dollars and the impact of the petroleum boom. Bishop Condon also presided over the construction of remarkable new church buildings across the region, from tiny towns like Highnam to rural county seats such as Roundup. Then there was the construction of the 1950s modernist landmark, the College of Great Falls [now University of Great Falls], which has arguably the state’s most coherent set of c.1960 “contemporary” style buildings. 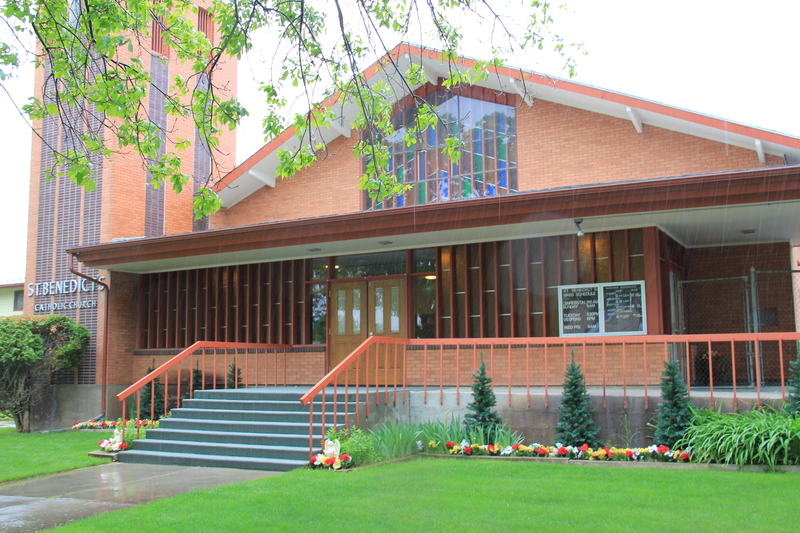 Over the next few months I will explore the churches associated with the diocese’s expansion in the 1950s and 1960s, giving particular attention to the buildings at the University of Great Falls. These compelling resources frankly were not on my radar screen in 1984-1985: like many others the buildings were too recent, and being devoid of easily classified architectural elements, I ignored them in favor of the historic Gothic and Classical revival church sanctuaries in the region. But more than a generation later, you can readily appreciate the dignity and the beauty of the churches. In most cases the congregations have been solid stewards, and the buildings still convey their original design and intent. 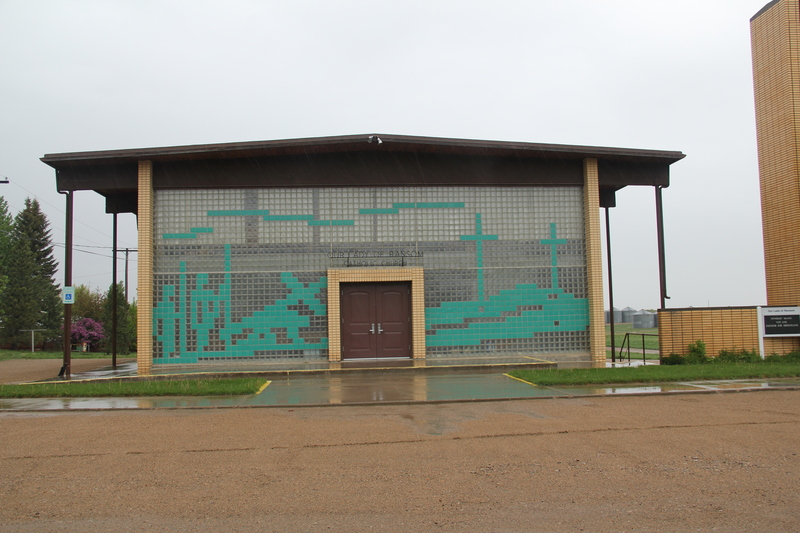 St. Benedict’s Catholic Church, Roundup. 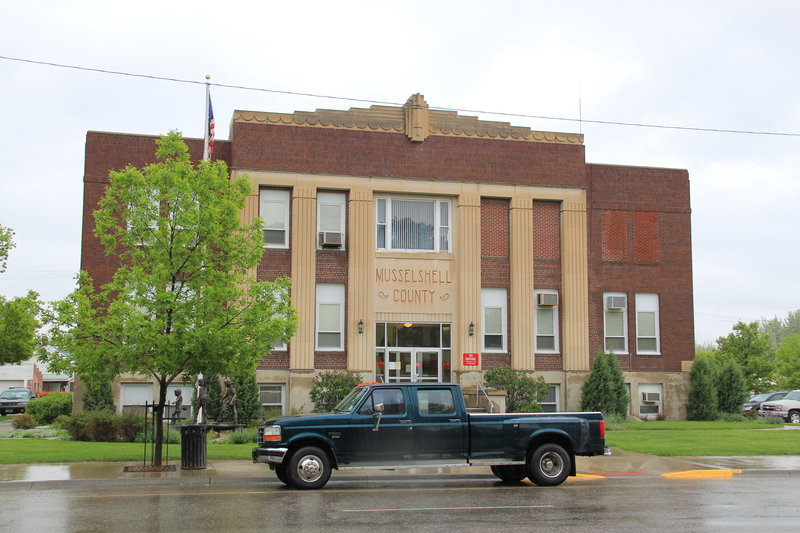 One reason I really like the Roundup church is that it faces, across Main Street (US 87), another modern landmark in eastern Montana: the New Deal-funded Art Deco-styled Musselshell County Courthouse. My second example for today’s post comes from tiny Hingham, a Great Northern railroad town in Hill County. 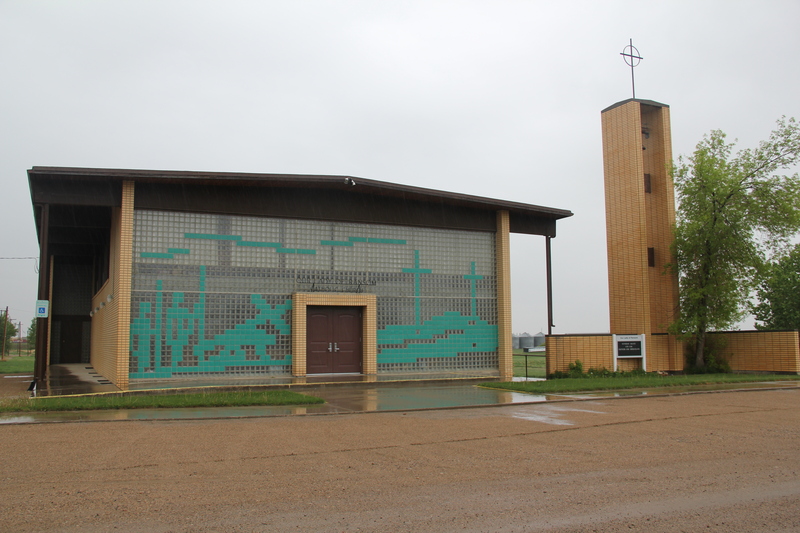 In 2010, its population was just over 100 but the town and surrounding ranch families have carefully kept the Our Lady of Ransom Catholic Church as a truly 1960s landmark. I apologize for the dark rainy images, but everyone that day on the Hi-Line rejoiced in the rain, and offered me a place to stay if I returned every May and brought rain. 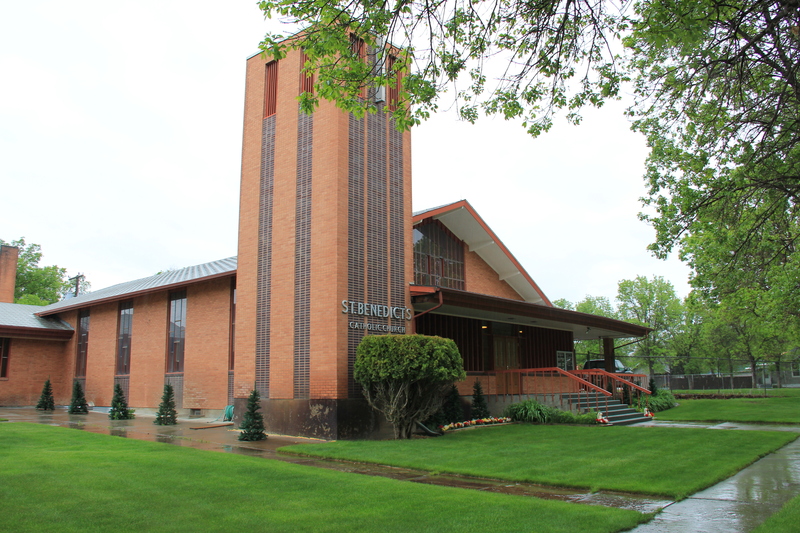 This entry was posted in Uncategorized and tagged Art Deco, Catholic church, contemporary style, Hingham, modern style, Roundup by carrollvanwest. Bookmark the permalink.